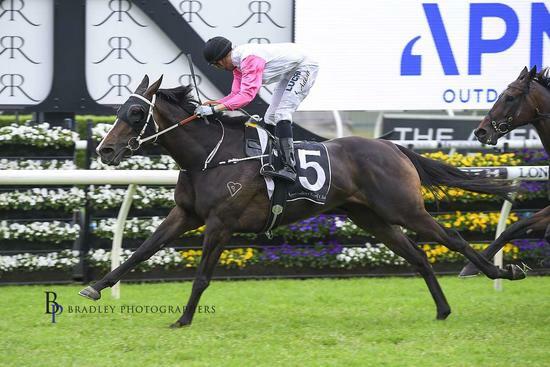 Heartlet has notched up her 2nd career win after winning the BM70 2400 metre race at Randwick on 6 November 2018 with Andrew Adkins aboard. Heartlet jumped from barrier 1, carrying 54.5kgs. Heartlet jumped well with the pack and was able to, with the benefit of a good barrier, settle into a box seat position. Heartlet looked great in her run and she relaxed nicely for Andre throughout the run. At the turn, Heartlet was travelling nicely for Andrew. She was able to moved up quickly to the leading pair and showed a great kick to easily put a length on the chasers. Heartlet won the race by almost 1.5 lengths to The Bandit in 2nd and Eerised in 3rd. We are so very happy for Heartlet to get another win on the board so soon after her maiden win. She is a lovely big, strong and kind mare who we love having around the barn. Hopefully there are many more wins to come for 'Simone'. Congratulations to Deidre and Alex. Thank you for your ongoing support.